The 1930s and ’40s were an important era for the diamond industry: De Beers launched its historic “A Diamond Is Forever” campaign; the Federal Trade Commission (FTC) made a ruling with regard to the use of the term blue white diamond; and Robert Shipley, who had already founded both the Gemological Institute of America (GIA) and the American Gem Society (AGS), began using the concept of the 4Cs to explain rarity characteristics to his students. The 4Cs, however, were never intended to be the whole story, and over time as we have continued to oversimplify the important characteristics of a diamond, certain myths, misunderstandings and complete falsehoods have become commonly accepted as facts. In this series of articles, we will attempt to correct some of the more glaring of these falsehoods. 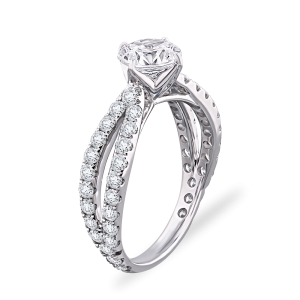 You can also watch the Diamond Myths video series on fireandicediamonds.com. Let’s begin with the effect of blue fluorescence on the appearance of a white diamond. The majority of online experts would have you believe that blue fluorescence always causes a hazy or oily appearance in a diamond. Martin Rapaport, chairman of the Rapaport Group, suggests that the problem concerns higher-color diamonds. Many appraisers believe they need to deduct value for fluorescence in any diamond, particularly when the fluorescence is strong. More than 20 years ago, however, the GIA conclusively proved that all of these assertions were wrong in its landmark study “A Contribution to Understanding the Effect of Blue Fluorescence on the Appearance of Diamonds.” The AGS is currently engaged in a new study of fluorescence. What these studies are finding is that for the most part (probably 80 percent of the time) blue fluorescence improves the overall appearance of diamonds. While fluorescence can cause a cloudy appearance in some diamonds, it is neither the strength of the fluorescence nor body color of the diamond that determines the effect. It is the transparency of the crystal. Gem-quality diamonds with high transparency look brighter and whiter under the influence of fluorescence, while diamonds with inherently poor transparency look hazier. In many ways blue fluorescence shines a light on the crystal structure of a diamond, usually improving the appearance but sometimes degrading it. You have to see a diamond in person to know. In other words: You should visit a retail store. There are many reasons we need to correct the misinformation about fluorescence—it’s the truth; people should know!—but the genuine need for a retailers’ expertise is a good one, and the fact that synthetic diamonds don’t exhibit blue fluorescence under UV light is another. If your diamond glows magically at the nightclub and sparkles magnificently in the sunlight, then you know it’s real. Fluorescent diamonds are a wonder of nature, usually outshining their inert counterparts, which is why customers should visit your store to see one in person.